Newsletters are an excellent way to keep in touch and can be an important communications tool with customers. Newsletters are frequently shared and kept for future reference, especially when articles have relevance to the reader. In an era of electronic communications and email, newsletters offer an alternative to more ephemeral communications. 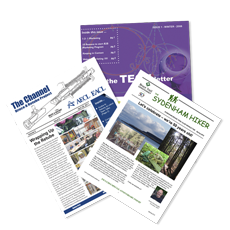 Newsletters are available in several sizes and formats. The most common is folded in booklet style with the most popular sizes being half-page 5.5″ x 8.5″ or standard 8.5″ x 11″ (finished size). Our standard stocks are heavyweight 90-100lb in plain or coated stock. Newsletters can be full-colour throughout, black or gray-scale or a combination of both. Newsletters can be personalized with imprinting of name and address from a database source. Paper/Finish: Paper ranges 80-100lb, coated or uncoated and variety of coloured stock. Colour: 4-Colour, Gray-Scale/Black or combination. Sizes available (finished) include: 5.5″ x 8.5″, 7″ x 8.5″ 8.5″ x 11″, 9″ x 12″ and custom sizes in between.